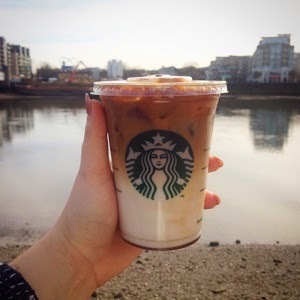 Today marked the launch of the Maple Macchiato in the UK. With a lack of information available online, I decided to head down to Starbucks to try the drink for myself. The delicious, multi-layered Macchiato begins with milk steamed until it's stretched and smooth to bring out its natural sweetness. Rich espresso is poured over the milk, where it creates an enchanting blend. Finally, the barista signs their work of art with a crosshatch of real Canadian maple syrup sourced from the Beauce-Appalache region of Quebec. As today was unusually bright, I decided to try the drink iced. Unlike its sister drink, the Caramel Macchiato, it's sweetness isn't overpowering. With a hint of maple and vanilla, the drink allows the taste of coffee to ooze through, rather than masking it. Whilst ordering I was also given a nifty loyalty card offering a free Macchiato once you order three. I couldn't find any information regarding how long this flavour will be available in the UK, however in Canada it's limited to the maple season, so get in there quick!